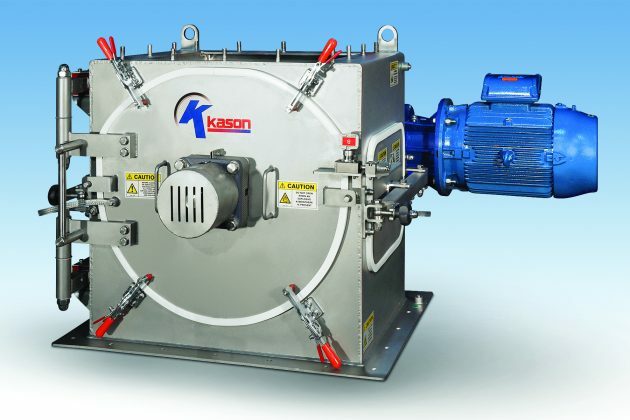 Its large 21 x 16.4 in (534 x 417 mm) inlet allows the direct discharge of compacted materials from 50 lb. (23 kg) sacks or bulk bags without the need for an intermediate controlled feed mechanism. The unit is offered as standard with a shaft supported at both ends for reliable service in high-load applications, or with a cantilevered shaft for improved access and cleanability in lighter duty applications. Side and end doors, which can be either bolted or hinged and interlocked, provide easy inspection and access to interior components. Material is gravity fed through an upper intake port and whisked against a contoured grinding screen by serrated blades projecting from a rotating shaft, driven at low speeds by a high-torque gear-reduced motor. On-size particles pass through the screen and fall through a discharge chute, while oversize particles remain in the milling chamber until reduced sufficiently to pass through the screen. Available in carbon steel, 304 or 316 stainless steel, Hastelloy and other alloys, it features interchangeable rotors and easy-to-change grinding screens mounted on a pull-out cradle. Screens are offered with round, square or rectangular apertures from 0.08 to 3.0 in. (2 to 75 mm), and with raised “cheese grater” lips to suit a wide range of process requirements. The unit can de-lump dried or hygroscopic materials that have agglomerated due to dampness or compaction, and is said to operate quietly due to slow shaft rotation. Typical applications include intermediate sizing of product for improved drying and granulation prior to tableting, regrinding of out-of-spec material for reclaim and pre-grinding prior to a secondary fine milling process or to speed up dissolution in liquid reactors. The LB 550 Lump Breaker is available constructed to pharmaceutical, food and industrial standards, and in ATEX compliant models for use in potentially explosive atmospheres up to and including ATEX21 internally and externally. The company also manufactures centrifugal sifters, round vibratory screeners, fluid bed dryers/coolers/moisturizers, static sieves, cone mills, vertical mixers, horizontal mixers, and double-cone and vee-cone blenders.